Government and civil society leaders from 43 countries convened in Atlanta to collaborate on strategies for peace-building on the theme, "Moral and Innovative Leadership: Building Healthy Families, Ethical Societies and a Global Culture of Peace." More than 800 participants from 43 nations examined the role of leadership in advancing human welfare at the fourth Global Peace Convention, “Moral and Innovative Leadership: Building Healthy Families, Ethical Societies, and a Global Culture of Peace,” in Atlanta, USA on November 29-December 2, 2012. Among the delegates were 9 former Heads of State, parliamentarians from 6 nations, elected officials, educators, diplomats, NGO representatives, and faith and business leaders. In 4 days of meetings, delegates participated in 37 plenary sessions, forums, workshops, and working groups featuring more than 150 speakers, presenters, and discussants. Previous Conventions have been held in Manila (2009), Nairobi (2010), and Seoul (2011). 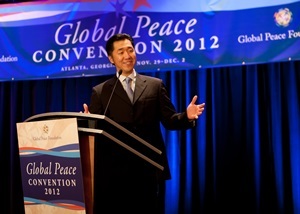 The 2012 Convention highlighted three key issues relating to moral and innovative leadership in the twenty first century: global interfaith initiatives, cooperation in the Americas as a foundation for hemispheric progress and prosperity, and Korean unification based on principles and values that can serve as a model for global peace.